While Mac users are getting their first official taste of the Chrome browser today, Windows and Linux users are also getting something. Finally, a day earlier than expected, Chrome Extensions are now live for everybody (before it was just for developers). 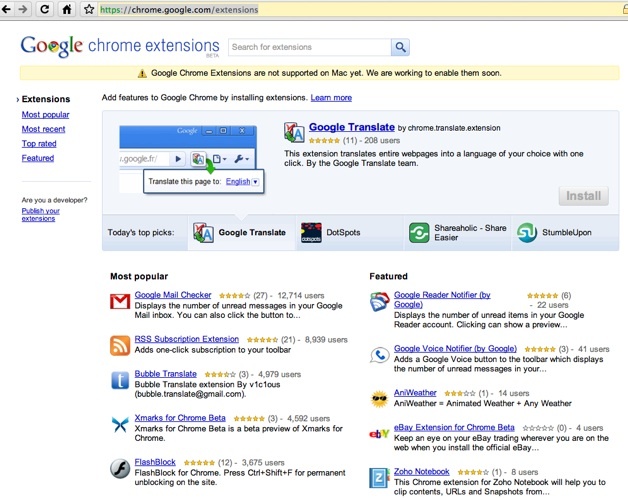 Extensions are what Google calls add-ons or plug-ins. We’ve been waiting for the Chrome extensions gallery to launch since last week. Here’s a preview of 11 early extensions, but now there are many more. Some featured extensions include ones from Brizzly, Picnik, Remember The Milk (ChromeMilk), Google Reader, NPR, Clip To Evernote, Woot, Feedly, and Chromed Bird. And they even have Facebook Adblock, although I don’t see regular Adblock (Update, there is AdSweep and Adblock is available elsewhere, see comments). I’d love to check these out, but I’m on a Mac. Guess I’ll have to wait. The extensions only work on Windows and Linux (in beta) for now. The wait shouldn’t be too long, however, since extensions already work in Chromium for Mac (the developer builds). Once my favorite add-ons or their equivalents hit Chrome, that is the last thing keeping me on Firefox.